Celebrating the Mass for Corpus Domini, Francis warns against the temptation to not take upon ourselves the needs of others, "dismissing them with a pitiful: 'God help you.' But Jesus’ solution goes in another direction, he "feeds the crowd that had come to hear him. 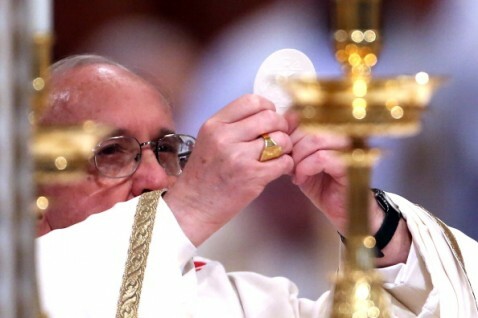 "In the Eucharist makes us follow His path, that of service, of sharing, of giving – and what little we have, what little we are, if shared, becomes wealth, because the power of God, which is that of love, descends into our poverty to transform it". Rome (AsiaNews) - Solidarity, is placing all that we have at God and neighbor's disposal, to follow Jesus who "becomes food, real food that sustains our life even at times when the going is rough, when obstacles slow down our steps". " Discipleship, communion and sharing " is the path Pope Francis indicates during the celebration of Corpus Domini. 20 thousand people participate in the open air Mass for the Solemnity of the Body and Blood of Christ in front of the basilica of St. John Lateran, the cathedral of Rome, despite the rainy day. And as the sunset they accompanied Francis in Procession - led by the Roman confraternities with their banners and traditional clothes - along the two kilometers that lead to the basilica of Saint Mary Major. In his homily Pope Francis commented on the Gospel passage of the multiplication of the loaves and fishes. It shows how Jesus feeds the "multitude" that "follows him, listens to himbecause Jesus speaks and acts in a new way, with the authority of someone who is authentic and consistent, who speaks and acts with truth, who gives the hope that comes from God, who is revelation of the face of a God who is love". "Let us take a step forward: whence is born the invitation that Jesus makes to his disciples to feed the multitude themselves? It is born from two elements: first, the crowd, having followed Jesus, now finds itself in the open, away from inhabited areas, as evening falls, and then, because of the concern of the disciples, who asked Jesus to dismiss the crowd, that they might seek food and lodging in the nearby towns (cf. Lk 9:12). Faced with the neediness of the crowd, the solution of the disciples is that every man should take care of himself: "Dismiss the crowd!". How many times do we Christians have this temptation! We do not care for the needs of others, dismissing them with a pitiful, "God help you." Jesus' solution, on the other hand, goes in another direction, a direction that surprises the disciples: "You give them something to eat. But how is it that we are to feed a multitude? "We have only five loaves and two fish, unless we go and buy food for all these people." But Jesus is not discouraged. He asks the disciples to seat people in communities of fifty people, He raises his eyes to heaven, recites the blessing, breaks the loaves, and gives them to the disciples for distribution. It is a moment of profound communion: the crowd, whose thirst has been quenched by the word of the Lord, is now nourished by His bread of life - and they all ate their fill, the Evangelist tells us". And again: " where does the multiplication of the loaves come from? The answer lies in the invitation of Jesus to his disciples: "You yourselves give [to them]...," "give," share. What do the disciples share? What little they have: five loaves and two fishes. But it is precisely those loaves and fishes that in God's hands feed the whole crowd. And it is the disciples, bewildered by the inability of their means, by the poverty of what they have at their disposal, who invite the people to sit down, and - trusting the Word of Jesus - distribute the loaves and fishes that feed the crowd. This tells us that in the Church, but also in society, a keyword that we need not fear is "solidarity," that is, knowing how to place what we have at God's disposal: our humble abilities, because [it is] only in the sharing, in the giving of them, that our lives will be fecund, will bear fruit. Solidarity: a word upon which the spirit of the world looks unkindly!". "Jesus this evening gives Himself to us in the Eucharist, shares our same journey - indeed, He becomes food, real food that sustains our life even at times when the going is rough, when obstacles slow down our steps. The Lord in the Eucharist makes us follow His path, that of service, of sharing, of giving - and what little we have, what little we are, if shared, becomes wealth, because the power of God, which is that of love, descends into our poverty to transform it. Let us ask ourselves this evening, adoring the Christ truly present in the Eucharist: do I let myself be transformed by Him? Do I let the Lord who gives Himself to me, guide me to come out more and more from my little fence to get out and be not afraid to give, to share, to love Him and others? Discipleship, communion and sharing. Let us pray that participation in the Eucharist move us always to follow the Lord every day, to be instruments of communion, to share with Him and with our neighbor who we are. Then our lives will be truly fruitful".